Glock handguns do not deliver the precision of a Swiss timepiece. You might expect more from a firearm that is one of the top selling handguns in the world and used by the majority of U.S. law enforcement agencies. Let’s explore the advantages of upgrading your factory trigger to a GlockTriggers custom trigger system. Most Glock factory metal trigger parts are manufactured using a process called stamping. This process yields parts with edges that would only be expected if an angry beaver had created them. The jagged edges and contact surfaces cause the parts to skip and drag, producing an unpredictable feel with erratic tension throughout the trigger pull. Using GlockTriggers’ proprietary process, the rough edges are refined. The result is highly polished surfaces that glide freely and produce an immediate noticeable improvement in the smoothness and consistency of the trigger pull. Glock factory parts produce a long take-up, mushy break and an excessive amount of over-travel. This is less than optimal when a situation calls for speed. Many of the GlockTriggers models, such as Skimmer, Edge and G43 RP, feature our proprietary pre-travel reduction modification. 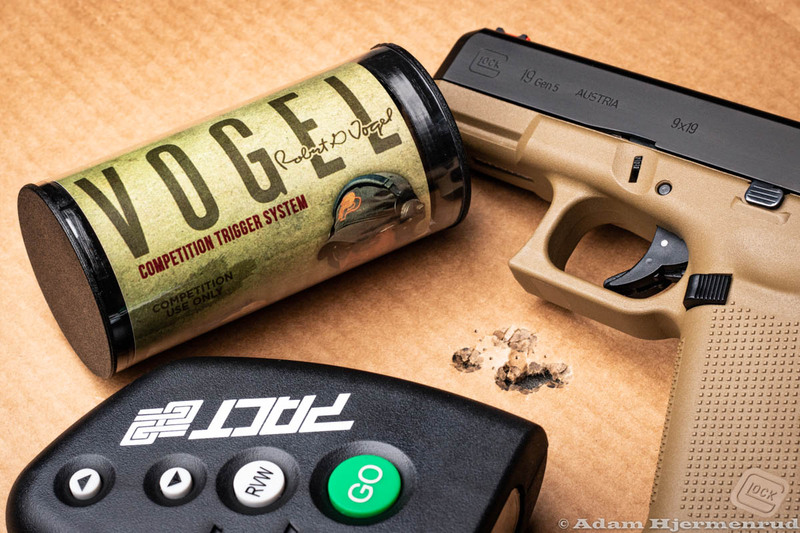 This eliminates nearly half of the take-up experienced at the beginning of the trigger pull. Our Vogel and Edge competition models include an adjustable overtravel stop, which shortens the reset and allows for faster follow-up shots. Accuracy is the ability to perform a task consistently and precisely. When shooting for accuracy, you strive to create the smallest group possible on the target. Your trigger must function in the same way each time it is pressed. GlockTriggers smooth take-up, crisp break and travel reduction modification assist the operator in reducing pre-shot muzzle movement. The factory trigger’s inconsistent long travel can rob the most experienced shooter of their optimal potential for accuracy. The “Safe Action System” of Glock handguns is one factor that launched them to their legendary status in the industry. “The Other Guys” manufacture aluminum parts using features and specs that focus more on marketing than on maintaining the original Glock trigger design. GlockTriggers systems are built with 100% OEM (factory) parts. The utilization of factory parts in ALL of our trigger systems ensures proper function and reliability. We test every individual trigger in a Glock pistol to ensure that all safeties function as intended. What good is it to own a firearm that is no fun to shoot? The most often heard complaint about Glocks is that the triggers are spongy, creepy and not operator friendly. Our customers report that upgrading to a GlockTriggers custom trigger system has boosted confidence in their shooting ability, has helped to improve their marksmanship and they now enjoy their range time more than ever. Posted in Glock Trigger Upgrade and tagged glock trigger upgrade, why upgrade glock trigger.